Having built his career by hand-decorating Maschinen Krieger ZbV 3000 (aka Ma.K) designs, it might be surprising to learn that these model kits aren’t what Kevin “Klav” Derken are referencing when he states that “I can honestly say nothing takes my paint style better”. 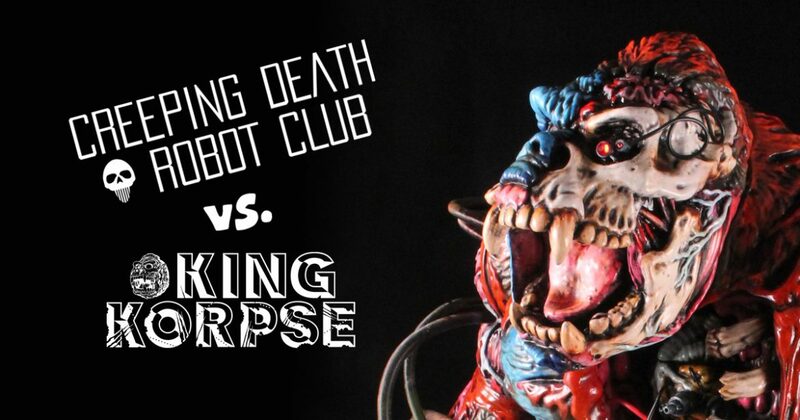 Known for infusing his works with a skeletal and biomechanical appearance, an aesthetic that’s become synonymous with his Creeping Death Robot Club branding, Derken now believes the ultimate sculptural form to express himself on is the James Groman and InstincToy collaboration rendition of King Kong in an undead state, the King Korpse (learn more here). “King Korpse is a masterpiece”, Derken unabashedly admits. “I’ve recently finished [modifying] a [Groman designed] Rotten Rexx for the first time”, the artist explains, “and it’s interesting to see James Groman’s original concepts before InstincToy. The two share a lot of similar details, techniques, and sections”, he continues, “however, the Korpse is different. It is on a completely different level, more refined and perfected. The details are deeper and more pronounced”. The reason for this sculpture’s superiority, according to Derken, is due to how Hiroto [Ohkubo of InstincToy]’s touch elevated the sculpt past all other toys and made it close to perfect”. And it is this example of hyper-detailed perfection that Derken has been lured towards modifying into his own art pieces repeatedly, resulting in six unique works that he’s completed in less than a year. “I never held a King Korpse until it arrived at my door to paint last December”, Derken admits, explaining that he had “bartered with a client to paint one for free in return for an opportunity to branch out to a new audience”. Using “the neon orange” Halloween Blank version as a base, the artist criticizes this piece’s original coloration, describing it as “so bright [that] I couldn’t see any details, just a giant slippery orange blob”. But a “few hours later I had it washed and primed”, Derken continues, noting how the “varied and deep” details had become apparent to him. “Every time I picked it up or moved it”, he discloses, “I found something new that I had missed prior”. And, eventually, Derken began painting his very first King Korpse form. “I spent almost two months working on it for a short time every day”, Derken recalls. “The collector wanted a ‘realistic’ look with some cyborg elements thrown in”, he explains, admitting how it “dominated most of my creative thoughts for the winter of last year”. Concerned with doing the form justice, Derken describes how he “repainted sections over and over again”, citing how the “form had changed with paint, and it popped even more once I started to tone it with oil paint”. Employing “some tricks and techniques learned from the plastic modeling scene”, Derken describes how “varied finishes” were used “to accentuate some of the hidden details”. While working on that initial King Korpse commission, “I started the quest to buy a few more aftermarket blanks”, Derken remembers, intending to use them as bases for hand-painted pieces he could display at that June’s Five Point Festival. As is common throughout his works, Derken created deeply layered colorations by painting “dark to light”, he explains, allowing his lacquers to “build up colors”. Due to this process, each “finished color is comprised of about three to four overlapping colors”, Derken reveals. Titled Fire, this unique piece “was definitely in reaction to the ‘realistic’ look of the first one”, the artist confesses, “I wanted the paint to pop”. As for the second one-of-a-kind King Korpse that Derken created to exhibit at the Five Point Festival, “I started calling it ‘old’ because it sort of looked like an older paint scheme of the first one”, he divulges. Contrasting wonderfully against the more fanciful colorations of Fire, Old “was made primarily with my favorite colors from painting Maschinen Krieger models”, the artist unveils. And by toning down and darkening much of the form’s surface, certain details became more prominent, such as the almost palpable wetness applied to the beast’s exposed tongue. Though the hand-painted Charred Bones piece was Derken’s fourth completed King Korpse creation, it would be the artist’s first experience decorating the form with its original head as opposed to the newer, opened mouth version. Commissioned by “a private collector from Hong Kong”, Derken was given “complete freedom” regarding the design. “I wanted to keep the fur lighter but not do a yeti”, the artist recalls, “so I reversed the bone color and started using fluorescent yellow”. “He wanted a ‘King Korpse like no other'”, Derken remembers of the “private collector in Taiwan” that commissioned the artist’s fifth hand-painted rendition of the Groman and InstincToy designed form. “I started with purple fur and added some fluorescent pink stripes”, he continues regarding this piece’s unique coloration. “I wasn’t too sure about it for a while”, Derken admits, “but, in the end, it really pulled together”. In fact, the artist’s own perceived success with this Outrun piece spurred him to become “more adventurous with the fur variation” on the form, an aspect he’d carry onto his contribution for InstincToy’s 2018 King Korpse Custom Auction. For the 2017 Tokyo Comic Con, InstincToy assembled a special collection of uniquely hand-painted King Korpse pieces by an international array of eleven artists, including Kennyswork (Kenny Wong), Kenth Toy Works, Remjie Malham, Candie Bolton, Black Seed (Kenneth Tang), and Josh Mayhem. Displayed for the duration of the convention, all these works were auctioned through an in-person only process that allowed for bidding until 3pm on the final day of the Tokyo Comic Con. A successful endeavor, every piece received bids with final prices ranging between ¥215,000 and ¥1,100,000. Due to the glowing reception it received, InstincToy decided to revisit this concept for the 2018 Tokyo Comic Con, inviting ten artists from around the world to transform King Korpse into their own artistic visions. For this second offering, contributions will range from returning creatives, such as Hiroto Ohkubo (InstincToy) and Jon-Paul Kaiser, to several new voices, including UNCLE, Heath Duntz (Boy in the Corner Studio), and Kevin “Klav” Derken. And, following this, Derken has no further plans to publicly offer his own works on the King Korpse form. Klav’s Final King Korpse Creation? “Originally intended as a blue-faced Chinese mountain monkey“, Derken says of his contribution to the 2018 King Korpse Custom Auction, he was about “halfway through” completing it when “the decision to modify the figure happened”. The reason for this direction shift occurred when Derken “was asked by Instinctoy to customize/mod the original sculpt to make it ‘more special'”, he explains. “I was almost done with the base paint when the request was made”, the artist continues, “so the wires and mechanical bits were added, and the rib cage was cut to expose the open chest and modified heart”. Taking him approximately three weeks to complete, Derken describes decorating this form as a “massive undertaking” but one that is obviously worth the investment of time based on the beautiful, finished results.